The United Nations proclaimed that 2019 will be the "International Year of the Periodic Table". Help the Western Michigan local section of the American Chemical Society (ACS) celebrate the 150th anniversary of Dmitry Mendeleev's critical contribution to all branches of science! Western Michigan ACS and GVSU Chemistry Department are looking for groups to help make the world’s largest Periodic Table to celebrate. To accomplish this, we must start NOW and we need YOUR help! Each element will be 216 inches across and 162 inches tall. This will make a Periodic Table that is 120 yards long by 53.3 yards tall, almost the size of a football field. We will put all elements together on October 19, 2019 for 2019 National Chemistry Week. Event held 10am-2pm at GVSU Kelly Family Sports Center. 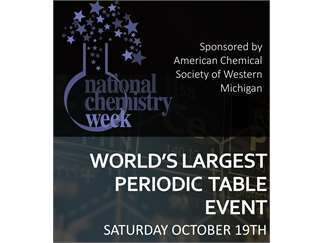 There will also be live chemistry demos and booths sponsored by the Western MI ACS local section, chemistry clubs from local colleges, universities, and area businesses. This event will be FREE and open to the public. We are competing for the Guinness World Record. See links below with more information. Please contact at dewittmi@gvsu.edu to claim your element. Act fast, they are being taken quickly!